Rob Westerberg is Choral Director at York High School in York, Maine as well as Director of the Portland Community Chorus. Mr. Westerberg holds a B.M. in Music Education from Keene State College and M.M. in Choral Conducting from the University of Maine. He is past President of the Maine Music Educators Association, the Vermont Music Educators Association and the Vermont Choral Directors Association. Mr. Westerberg has managed District, All State and Eastern Division Choirs and served as chairman for the Maine All State Music Festival in both 2005 and 2006. He has also served the Maine Department of Education in the rewriting and revision of the Maine Learning Results for the Visual and Performing Arts, and was a co-founder of the Maine Arts Assessment Initiative. Among his recent honors, Westerberg has been a recipient of the Keene State College Department of Music Distinguished Alumni Award, the inaugural Carol Trimble Award for Exemplary Service to Arts Education by the Maine Department of Education and the Maine ACDA Distinguished Choral Director Award. At York, his choirs annually consist of one third of the student body and twice his YHS Chamber Singers have performed at Carnegie Hall under the direction of Dr. Dennis Cox. Mr. Westerberg has directed the Portland Symphony Orchestra's Magic Of Christmas Choir, guest conducted nearly sixty Honors Choirs throughout New England and in April of 2016 joined Dr. Richard Nickerson in conducting the Maine Festival Chorus at Carnegie Hall. At York High School, he established a graduation requirement specifically for music - the only public High School in the northeast to possess one - and has been a resource in northern New England for the implementation of standards and proficiency based learning and reporting for music and arts education. Liz is a graduate of McGill University, Montreal, in music education and voice, and received her Master's degree in Choral Conducting from the New England Conservatory of Music in Boston. She conducted and toured with the Windham Chamber Singers for two years and taught music and theater in the Auburn schools for eleven years. Her passions extend beyond the stage to include snowboarding, sailing, swing dancing, photography and sewing. She lives in North Yarmouth and summers on Peaks Island with her husband Kevin, and her two sons. She is "delighted to have the opportunity to work with such inspired and talented singers in the Portland Community Chorus". 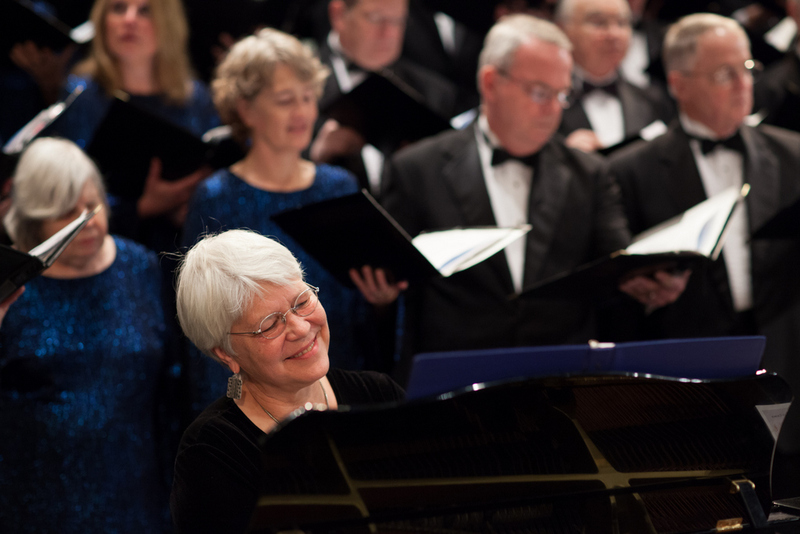 This is Jan's twenty-second year as accompanist for the PCC. She is also a private piano teacher and the choir director at Brackett Memorial Church on Peaks Island, where she also directs the Peaks Island School Chorus. She retired in 2009 from the Cumberland School District, where she worked as a choral director for 28 years. Jan holds a B.B. in music from Clarke College in Dubuque, Iowa; a Masters Degree in piano performance from the University of Western Ontario, Canada; and a Masters Degree in choral conducting from the University of Maine. She enjoys island life, playing chamber music, gardening and spending time with her daughters.